This noncompetitive Japanese martial art aims to harmonize energy with that of a partner or opponent in order to achieve both physical and emotional mastery through peaceful resolution. Aikido literally means the path to the coordination of body, mind, and spirit. Aikido is a defensive system of continuous, circular motions, combining many of the fluid, dance-like movements of t’ai chi along with more subtle, stylized techniques. When practiced properly, successful defense is achieved through minimal action. Originally seen as a combination of religion and martial arts, aikido was created by Morehei Ueshiba in the early twentieth century. The movements in Aikido are not designed to stop attacks or to conflict with them. The principles of Aikido are such that all movements are allowed to continue and complete themselves. An aikidoist blends with the movement of an attack and redirects it to a conclusion. Aikido is based on principles of correct movement rather than on strength, it can be practiced by persons of all ages and physical abilities. Most attacks come in a linear direction. Aikido movements are circular. An aikidoist leads a straight attack in a circular motion thus becoming the center of movement for both bodies. By directing the intent of the attacker in this manner, we say we are ‘leading’ the person’s ‘ki’ (energy or spirit). This requires a calm, relaxed mind and body and a great deal of self-control. Calmness allows for clear perception of the situation and a relaxed body is capable of swift, instinctive response. 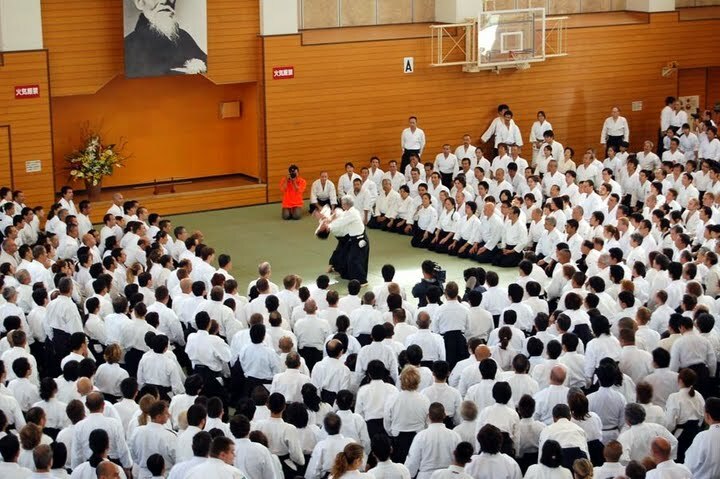 The concept of Ki is important to the practice of Aikido. Specific warm-up exercises and practice of Aikido techniques improve the flow of Ki within our bodies. An increase of inner strength is a major benefit of constant practice. As one continues to practice, improvements are noted in health, flexibility, and self confidence. The body and mind become more coordinated and balanced and the delay between the decision and action is reduced. The basic Aikido movements are either entering to the safe side of an attack or turning to join with the direction of the attack. The movements are simple in their concept. However, after beginning practice, one discovers how hard it is to coordinate distancing, movement and coordination of the limbs at the same time. Aikido is a sophisticated martial art which requires a great deal of practice to become adept. New students are soon amazed at the countless techniques which are possible with variations and applications on basic movements. The 1st thing one learns in Aikido is how to fall safely. These important lessons prevent injury during practice. Next, one learns the basic techniques and body movements. Advanced practice includes further techniques and practice to improve perception and intuition. Aikido movements usually conclude with a throw or an immobilization technique applied to the joints of the hand or arm. While the application of some techniques can be painful, they are not designed to cause permanent injury. Most techniques follow the body’s natural movement and the joint manipulations occur in the natural range of motion of the joint. A benefit to practice is improved strength and flexibility of the joints. While Aikido may appear to be a soft martial art, this is due to the control exercised during execution of the technique. With its wrist locks and atemi (strikes to vital points of the body), the techniques can be performed powerfully if necessary. Because Aikido is based on principles of correct movement rather than on strength, it can be practiced by persons of all ages and physical abilities. Since there is no competition in Aikido, practice is an enjoyable learning experience. Aikido is real and it is powerful. It takes a lot of training and mental fortitude to be able to disable an opponent without hurting him. The above clip  demonstrates one possible end product of your Aikido training. Aikido is considered as the best martial art for preventing injuries. Since it inherits the power of Katachi training, Aikido prevents injuries in the best possible way. It comprises of various moves that can make the aikidoka win without getting injured nor hurting the opponent. Many of the strikes (打ち, uchi) of aikido are often said to resemble cuts from a sword or other grasped object, which may suggest origins in techniques intended for armed combat. Other techniques, which appear to explicitly be punches (tsuki), are also practiced as thrusts with a knife or sword. Kicks are generally reserved for upper-level variations; reasons cited include that falls from kicks are especially dangerous, and that kicks (high kicks in particular) were uncommon during the types of combat prevalent in feudal Japan. The year 1942 is often cited as the beginning of modern aikido. It was at that time that the Dai Nihon Butokukai, desiring to achieve a standardization in teaching methodology and nomenclature for modern Japanese martial arts, reached an agreement with the Kobukai representative Minoru Hirai to call the jujutsu form developed by Morihei Ueshiba aikido. Thus, AIKI BUDO joined the ranks of judo, kendo, kyudo and other modern martial arts.